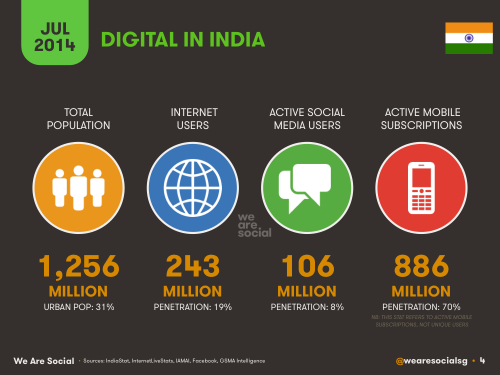 “India’s digital landscape is evolving fast, but overall penetration remains low in the world’s second most populous country, with fewer than 1 in 5 Indians using the Internet in July 2014,” says We Are Social in its latest report – Social, Digital and Mobile in India 2014. The Singapore based digital agency which has been known for its APAC reports states that social media use in the country is growing with Facebook alone adding 16 million new users since January – that’s roughly one new user every second. According to the social networking giant it has more than 100M active monthly users in the country. Besides this India which has been a proliferating base for mobiles in the country has driven the growth of social media too. 70% of internet page views in India originate from mobile devices, while 87% of all Facebook users access the platform through mobile. While these are the positives the internet penetration in the country has been in a sorry state and one of the dominant reason is the country’s internet infrastructure. India continues to have the slowest average Internet speed among countries in the APAC region according to a study conducted by Akamai Technologies for its Q1 2014 State of the internet report. The average Internet speed in India was 1.7 Mbps after an increase of 8.4% from the previous quarter and 34% from Q1 2013, ranking it 117 internationally in terms of average broadband speed. 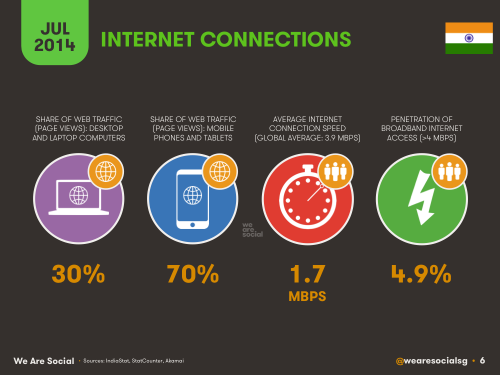 India ranks 85 internationally in broadband adoption, since only 4.9% of the connections here have speeds of over 4Mbps. This has affected the social media penetration in the country. Despite being Facebook’s second largest market worldwide, social media penetration in India remains at just 8%. Despite these slow speeds, internet users in India spend almost 5 hours on the net every day, with 40% of that time spent on social media. 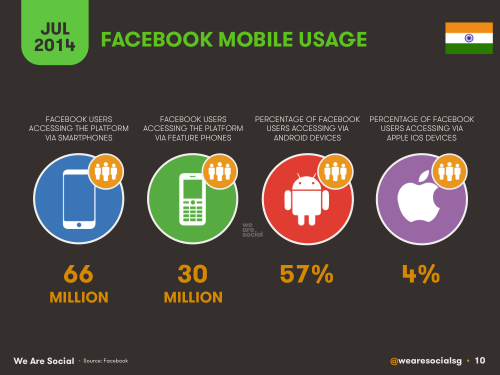 Additionally, mobile drives social media usage, with almost 9 in 10 Facebook users accessing the platform via mobile. The report also highlights the fact that 30 million people in India access Facebook through a feature phone and 66 million via smartphone out of which 91% access via Android handsets. Meanwhile, around 4 million users access Facebook across both feature phones and smartphone devices. Samsung claims the lion’s share of Facebook mobile users, with 32 million users accessing the platform. Nearly 18 million Indian users access Facebook via Nokia devices. 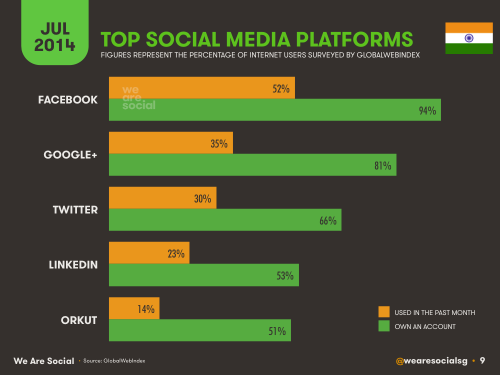 When it comes to social media Facebook rules followed by Google+ with 35% of internet users claiming to have signed in at least once in the past 30 days. Twitter, LinkedIn and even Orkut are on the list. With 14% used in the past month, Google has done a right decision to kill Orkut. The report also focuses on the mobile penetration and activities on it. There are 350 million unique mobile users in India who use it for entertainment and social media as the primary activities. Video consumption has increased, however most video viewing on mobile devices in India is driven by memory card transfer, rather than via internet streaming. Find out the entire report with much more detailed analysis at SlideShare.